Home » food , history , italy , pompeii , restaurants , roman empire , volcanoes » Snack bar in Pompeii reopens for first time since 79 A.D. 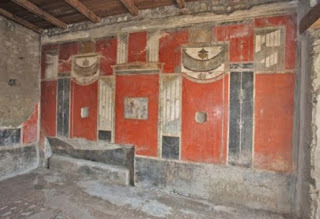 Snack bar in Pompeii reopens for first time since 79 A.D. The last time that the thermopolium in Pompeii, Italy enjoyed patronage was August 24th, 79 A.D. And then nearby Mount Vesuvius erupted and completely buried the city. The stylish snack bar was evacuated in such a hurry that the tip jar was even left behind. As of this week and under new management (previous owner Vetutius Placidus having long since retired or worse), the thermopolium of Pompeii has reopened for the first time in 1,921 years, and is reportedly already enjoying a thriving business! The menu for the first day included sugary treats that Roman citizenry were known to enjoy, but from here on out the thermopolium will be serving up a more modern repast.